‘”Wagging school” is dodging a commitment, forsaking a good for something less, letting go a long-term goal for a short-term diversion. But the action of these students was quite the opposite. Not self-indulgent, but more considered, much more virtuous.’ Fr Ross Jones SJ reflects on the School Strike 4 Climate. 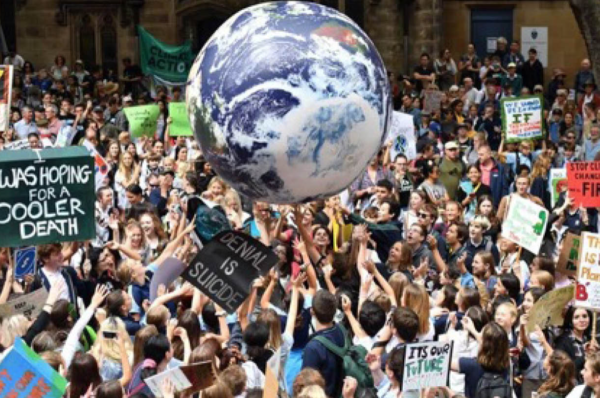 On 15 March, 25 Aloysians (mostly members of the Benenson Society, St Aloysius’ College’s human rights advocacy group) joined some 25,000 students in the School Strike 4 Climate protest at Sydney Town Hall. All with parent permission and school approval. Students from other CAS schools (Barker, Cranbrook, Knox and Waverley) also made their presence felt. Hundreds of thousands of students united worldwide in solidarity. In Australia, there were rallies in 55 towns and cities. Concern about climate change is to the fore — no longer disparagingly seen as the preserve of ‘lefties, greenies and tree-huggers’. A younger generation is wanting more from their political leaders. They are calling for a climate action policy because they believe their government has been bereft of a consistent one for five years. Federal Education Minister, Dan Tehan, was urging students not to join the demonstration, suggesting the School Strike 4 Climate action was orchestrated by ‘professional activists’ who were engaging in ‘appalling political manipulation’. In fact, the organising group has been funded to the tune of $786k by his own government. Using language which rather dated him, Mr Tehan labelled the students action as ‘wagging’. A complete misnomer. ‘Wagging school’ is dodging a commitment, forsaking a good for something less, letting go a long-term goal for a short-term diversion. But the action of these students was quite the opposite. Not self-indulgent, but more considered, much more virtuous. The model of education in the Ignatian tradition, our pedagogy, has at its heart the cycle of Experience-Reflection-Action. Of course, that process concerns itself with ‘nuts and bolts’ schooling in traditional classes. But always Reflection and Action. And our walls are much more porous these days than before. Learning spaces are limitless. Concerning mission, Ignatius once said of his Jesuits, ‘The world is our home’. The same can be said of the formation we offer in the schools’ ministry. It is no longer confined to a class or art room, to library or lab. More than that, our formation is not simply ‘head stuff’. It is cultivation of the heart, naming dreams and passions, shaping virtues and values. From the days of our first Jesuit Colleges, the schools claimed a civic purpose as well as academic and spiritual ones. When we opened a school in Tivoli in 1550, it was said to be done ad civitatis utilitatem — ‘for the benefit of the city’. Two years later, in opening another college in Valencia, Ignatius’ secretary, Juan Polanco SJ, wrote that the schools were to be powerful instruments ‘for the reform of the cities’. For the reform of the cities! The scope was bold. Our schools have never simply been about a good graduating credential for a secure career, nor even for a sure ‘ticket to heaven’. There is a broader claim made on our students. ‘We do not exist for ourselves alone’ was the Ciceronian motto of those first schools. So as to direct the boys for the best, in our Ignatian formation, we form consciences, certainly. But we make no apology for fashioning social consciences as well. Turn the clock forward nearly five centuries from those Valencia days, and Fr General Sosa has now commissioned the Jesuits, and those who partner and work with us worldwide, with four Universal Apostolic Priorities. The fourth of these is ‘to collaborate in the care of our Common Home’. He reminded us that ‘the preservation over time of the conditions of life on our planet is a human responsibility of immense ethical and spiritual importance’. He asked for urgent action to help curb and stem the deterioration of the environment. It was an invitation to which our students responded that Friday. If those students who rallied have a passion to work for the common good, to understand that building God’s Kingdom means acting in the here and now, if they have fire in their bellies, if their consciences take them to the streets … then they are living out a long tradition. And God bless them for it.